This is a great activity to encourage the development of sorting skills as well as fine motor skills. At the same time this activity will also help with recognition of colors, shapes, textures, and sizes. All of these skills are very important for young children. These types of activities also provide healthy stimulation as well as fun and entertainment at the same time. Another plus is this is completely free. It does not cost a penny. First let him to play with the container of socks. My son started with removing one sock and a time and placing them on the table. Then he placed them back in the bin one at a time. He repeated this process several times. This will give him time to visualize and feel the socks. Next initiate the sorting. Choose two matching socks, remove them from the container and lay them out in front of you. Your toddler may try to copy. If not continue another one or two times. He will get the idea. At first I found it best to start of with just a few pairs of my son's own socks only. I increased it a little each time. Eventually we will start adding mommy and daddy's socks as well to make it more interesting. I am enjoying watching him as he progresses. 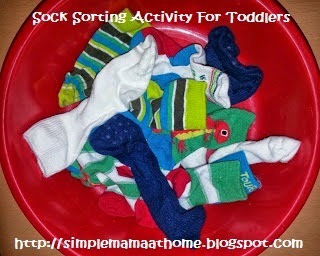 Have you done any sorting activities with your toddler or young child? Would you like to share? Thanks for sharing such a simple, yet effective idea. We've not done this, but I'll try it this weekend with Little Man - I'm sure he'll love it. Thank you! My little guy loves this. At first he spent alot of just emptying the container of the socks one by one and then returning them back one by one. He is slowly getting the idea. I am sure it won't be long before I will be trying to make it more interesting for him! Thank you! I will be sure to make this my little guy's job when he gets the hang of it enough. I have linked up on Family Friday. Thank you for the invite! Looking forward to reading other blogs on this link up. I think that this would be great because it would also stop him from complaining about how I turn his socks in to connect them so I don't have to sort through them every morning :) Two birds with one stone. I think I have found my son's new laundry job. I agree this will make a great job for any little one. Good idea:) My 4 year old daughter likes to help me orginaze the laundry and she is good on folding socks. I think the laundry room is actually the best place for kids to start learning and helping with chores. Your little girl must feel so proud helping her mommy! Aww... I actually did this with my little guy all weekend! It was fun and now I feel so much better! A clean house seems to always make you feel great, doesn't it? Awe I found the most fun part for me was helping him and watching him. The expressions on his face are priceless. I have to agree about feeling great in having a clean house! Yes it is and also doesn't cost anything. I will check your attached post today. Sounds like a great activity and a great way to get your toddler into helping out. Yes it turned out to be a great activity! Great sorting idea! My kids have always loved helping with the laundry. Sorting, folding, washing...they are all great ways to get the kids involved! This is a super cute idea! Thanks so much for stopping by and sharing on Family Friday Link Up Party! Great idea. We're looking for ways to get the little one involved more with chores. And this way he can learn as he does it. Thanks. This is a great game that we play also. It works with face towel folding and dish towel folding.